I decided to give this recipe a try after watching Vivianna Does Makeup’s video. I changed it up a bit and use some mashed berries. I’ve since made it with mashed banana and topped with chopped pistachios which was delicious! Also totally yummy with just oats, seeds, nuts and milk. This has fast become my favourite weekday breakfast (everyone knows weekend breakfasts are all about mashed avocado and egg), it only takes a few minutes to prep the night before and keeps me full until lunchtime. It’s dead easy. Mix together the oats and coconut milk. Add the mashed fruit, seeds and nuts (I bash the hazelnuts and almonds with a rolling pin rather than adding them whole), give it a big stir and leave in the fridge overnight, or for at least 3 hours. That’s it! I add a couple of seeds/berries to the top in the morning. 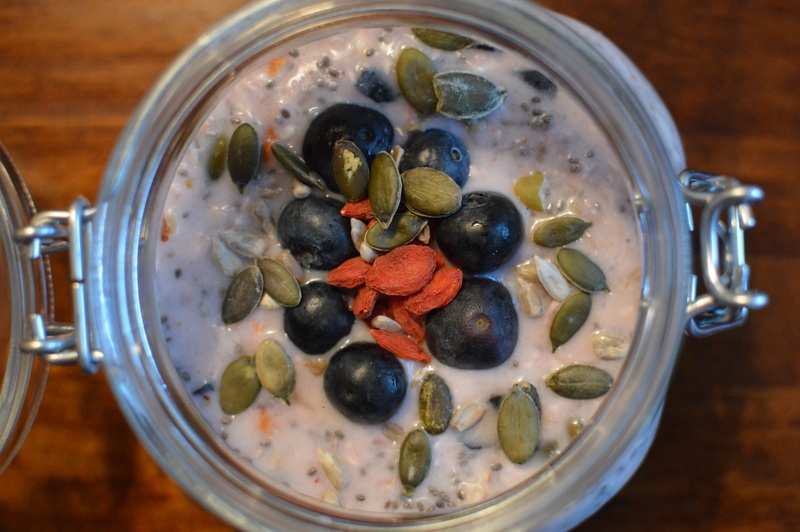 What do you add to your bircher muesli?